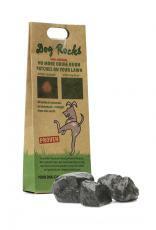 Dog Rocks are a new and exciting natural product. All Natural minerals, no chemicals – straight from the earth. When placed in dogs water bowls it will reduce dead patches of lawn from the urine. Dog Rocks must be replaced every two months. Dog Rocks will take up to 5 weeks to start working. Dog Rocks will not alter the Ph balance of the urine.